I didn&apos;t get much sleep that night. I couldn&apos;t stop thinking about the match. I was beyond nervous, what if something went wrong? I finally did get sleep. I slept for about five hours before Charlotte woke me up at eight. "Hey," I smiled at her, trying to hide my true emotion. I got up without questioning and showered. I put on some jeans, a Shield T shirt and black converse. I started packing my ring gear in a bag. "You look nervous," Audrey commented as she walked over to stand in front of me. I sighed. Audrey always had a way to tell what people were thinking. "I&apos;m freaking out," I told her as I threw my combat boots in my bag, "I think I&apos;m going to be sick." Audrey rubbed my shoulder, "Isn&apos;t this all you ever wanted? 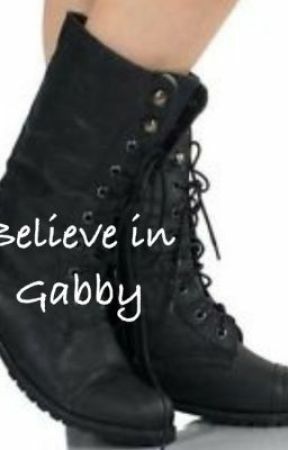 This is your dream, Gabby." I ran my fingers through my hair, "Ever think that when you thought you were prepared for something, but then when you got there, you didn&apos;t know if you could do it?" I looked over at my cousin. Audrey thought for a moment, "I think everyone has those obstacles, but you can&apos;t let your nerves hold you back. You&apos;ve got to crush them!" It wasn&apos;t making me feel any better. The door knocked. Audrey walked over to get it. Dean, Seth and Roman all walked through the door and into the room. "You ready, Gabaru!" Seth cheered, punching my shoulder lightly. "Trust me Gabby, once you get out there, all your nerves will go away," Roman tried to assure me. "We&apos;ll see," I got up. "How about a little Pre Wrestlemania Workout to get your mind off it," Roman suggested. I thankfully agreed and changed into sweat pants and sneakers before we walked to a nearby gym. The four of us separated. I went right to a punching bag and started nailing it, trying to shake the nerves off. Usually working out cooled my mind, but it didn&apos;t seem to be helping. At about 12, we all piled into a car and drove towards the arena. "Have you guys seen the stage yet?" I asked them. "I think I&apos;m going to faint when I do," I said. Dean squeezed my shoulder, "Hey, you&apos;ll do great. Just pretend no ones watching you." Seth looked back at me from the passenger seat, "Except know deep down that their are about 80,000 people watching you and millions more at home." We walked into the arena side by side. I stopped. I started heading to the Divas Locker Room. My heart racing, I opened the door. None of the divas seemed as nervous as I was as they excitedly talked. I set my bag down and yanked out my Shield attire. "Gabby," Brie greeted, "How are you feeling." "Not to bad," I muttered. Nikki skipped over to us, "I&apos;m so excited!" "You guys want to go check out the arena with me?" The Bellas agreed and the three of us headed down the hallway. Their were tons of legends. I almost passed out when I saw Stone Cold talking to Hulk Hogan. Brie led us up to the place where all the producers were controlling the cameras and lights. My heart stopped. The arena was huge. The ring looked like the size of a lego. I stood next to Dean, Seth, Roman. We we&apos;re preparing to make our entrances. I was wearing my normal Shield gear, and held a Shield mask in my hand. "You ready," Dean put his arm around my shoulder. "Yeah, I&apos;m good," I breathed. Kane, The Outlaws and Summer were already in the ring. Sierra. Hotel. Indigo. Echo. Limo Delta. Shield. I appeared at the top of the stairs in front of the guys. My breath caught in my throat. All my nerves seemed to disappear as I started walking down the stairs, a huge smile on my face. I hopped over the barricade and looked around the whole arena. Everyone&apos;s eyes seemed to be on me. Me and my brothers. My eyes went to Summer. She was giving me a nervous look. The moment I was waiting for was now. I&apos;m sorry, I know it&apos;s really short :(. Next chapter will be the match.